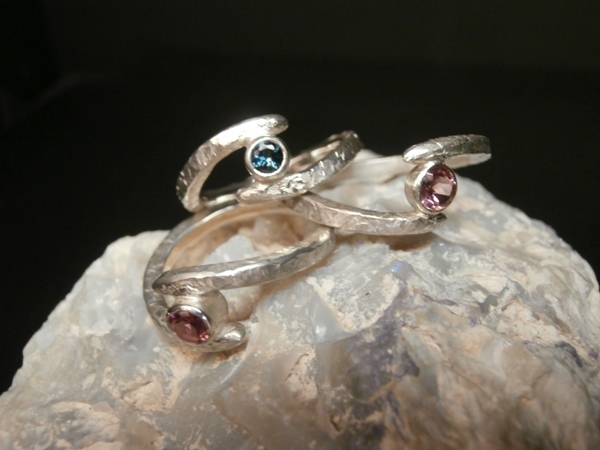 I studied a HND in ‘Jewellery and Applied Arts’ in Manchester and then went on to complete a degree in ‘Metalwork and Jewellery’ at Sheffield Hallam University. 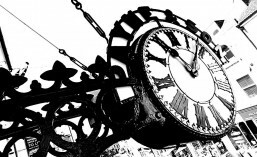 I graduated in 2009 and set up my workshop in North Somerset shortly after. My work is a range of sculptural and bold silverware and jewellery. 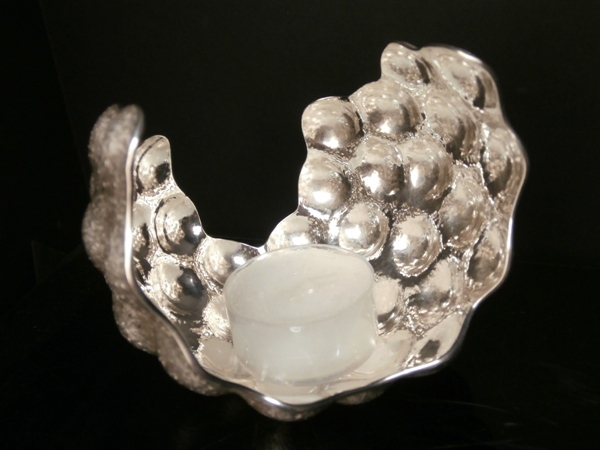 Most pieces are hammered from flat silver sheet using the techniques of hollowing, hand raising and planishing to create a three dimensional form. Chasing punches or textured hammers are used to apply different surface finishes to the object. I use many of the same tools and textured hammers to create both the large silverware pieces and the jewellery. I use a sketchbook to initially plan my pieces but truly they come to life through the making process, I am very hand’s on experimental with my material. Rather than trying to control the outcome I allow my material and tools to guide me through the making, my subconscious takes over the design. I am very visual my work is about form and texture as well as function. It is important to me to get out and see new places to refresh my head. Much of my visual diary has come from the highlands of Scotland where I visit regularly. With the Bulbous and Boulders collection, I had looked a lot at the idea of a foreign object attaching itself to another or taking over it completely, in this case barnacles on rocks, sometimes there are just a few and other times they smother the rock face. 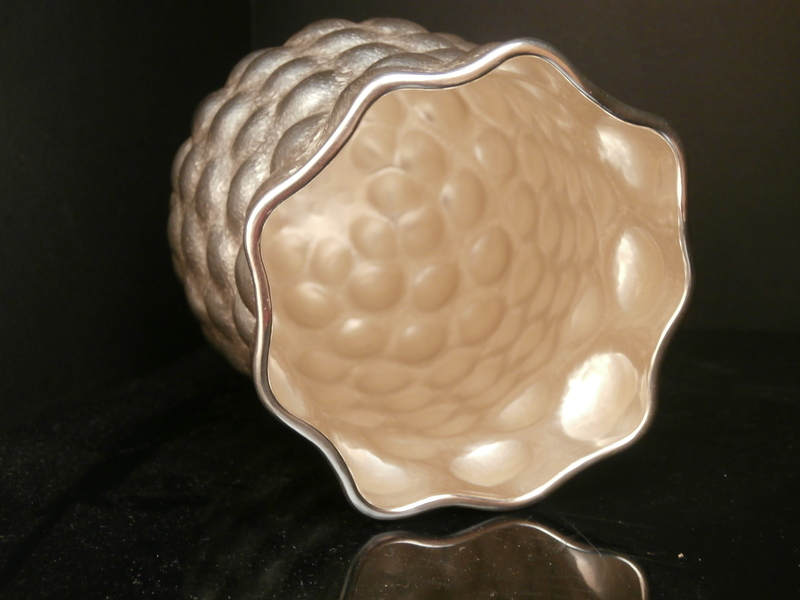 My first Bulbous pieces had areas of smooth planished silver contrasted with the bobbly forms. Later I started making pieces where the bobbly forms consumed the whole surface of the object. The Boulders pieces really followed on from this but for me they show more of the strength of character of the highlands. There is still much to come from the influence of the highlands in my work but it is certainly not the only place I look to for inspiration. I also love old buildings and ruins, crumbling walls and castles. My interests lie with the ancient and old, things with a visual history. I like the idea of the rugged and earthy, something simply dug up from the ground.